Since I've started ultra running just a little over 2 years ago, I've completed 24 ultra marathons. While I was able complete race distances from 50 kilometers to 148 miles, there was almost always severe suffering and pain involved. So when I sat down in November of 2011 to plan my race/adventure schedule for 2012, I also looked at my training load over the past 2 years. What I found was a little disappointing. Out of over 100 weeks of running, only 15 weeks consisted of 50+ miles of running. Considering the suffering I went through in the longer distances, it became clear very quickly that my weekly mileage just wasn't enough to prepare me properly for these distances. 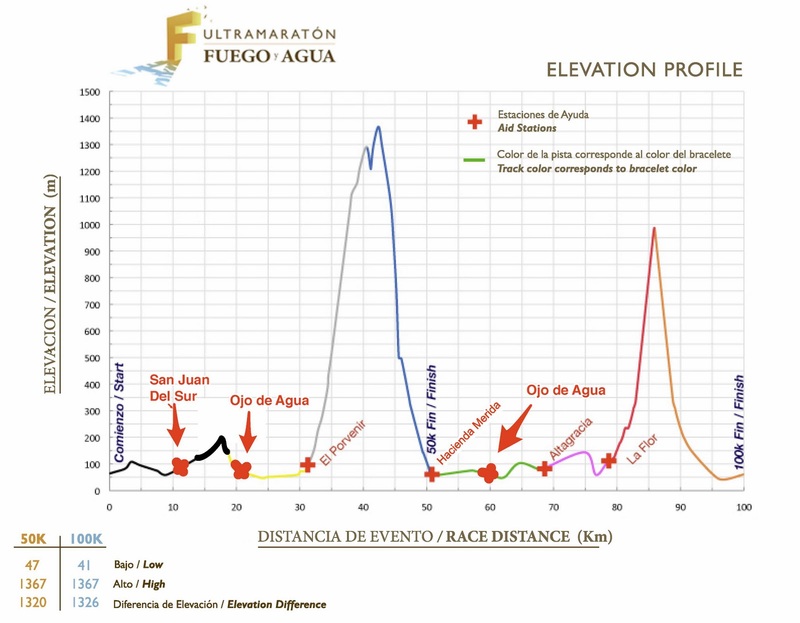 First, I had registered for the Fuego y Agua 100K in Nicaragua, an extremely challenging ultra marathon that involves some serious elevation gains while crossing two volcanoes. The second major event I registered for was the Double Top 100 Mile race taking place just two weeks after the 100K race. I wasn't looking to win any events, just complete them "more comfortably" if that is a reasonable goal. So I decided to integrate more structure and more distance into my training. While preparing for the Rocket City Marathon to attempt a Boston qualifying time, I injured my right ankle during the Dizzy Fifties trail race in early November, tearing a tendon. After seeing a sports doc and getting an ankle brace, I refocused my training, targeting hills, trails and distance as my major training goals in preparation for the two back to back events I had scheduled for mid February and early March. 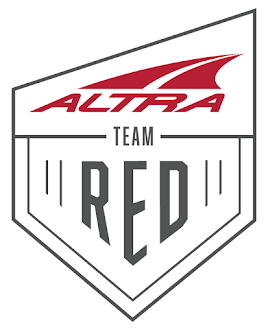 I the last few weeks, RD Josue Stephens has been sending out race information and posting updates on the race's Facebook page. The images and charts in this post are mostly from those sources. If that image doesn't scare you, then you should definitely sign up for next year's event;-) I started thinking about drop bags and finally decided to just go with one drop bag at the halfway 50K point of the race. I edited the chart below and creates a credit card sized laminated version of it for the race. 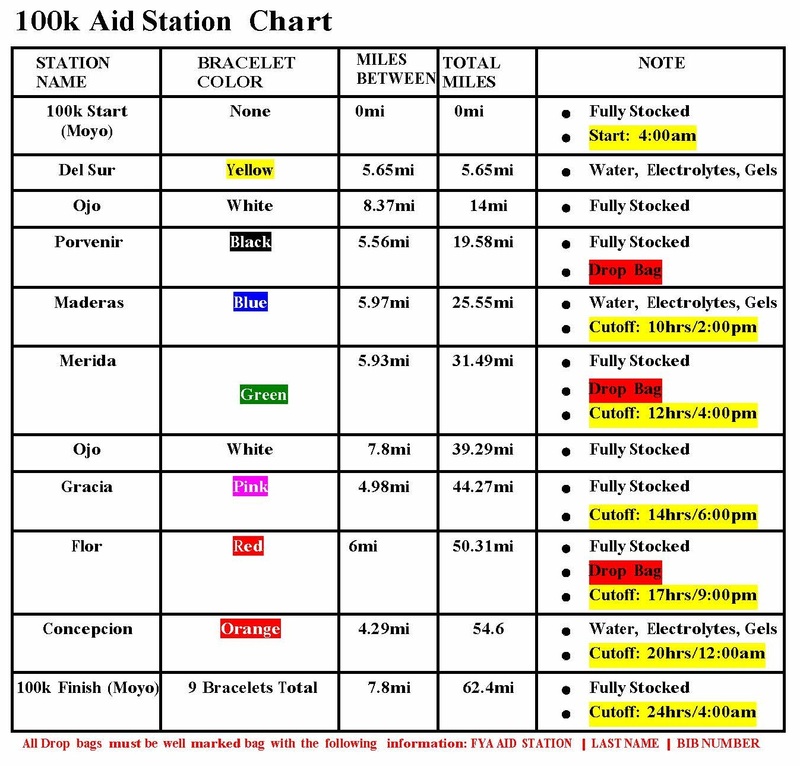 Hopefully, this little card will keep me focused in my quest to make it from one aid station to the next...and always collecting the proper bracelet. 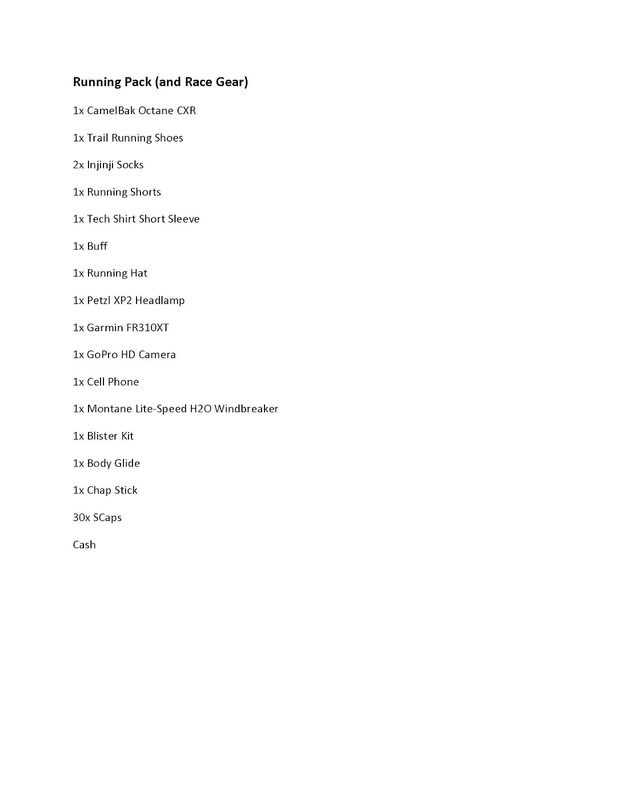 The list below lays out the drop bag contents I have planned and packed for the 50K aid station. I figure new shoes and clothes, if needed as well as the usual nutritional items, head lamp and a blister kit. Hopefully, all of these things will be overkill and I'll just breeze right through the aid stations...without forgetting to pick up my head lamp and other necessities, of course. 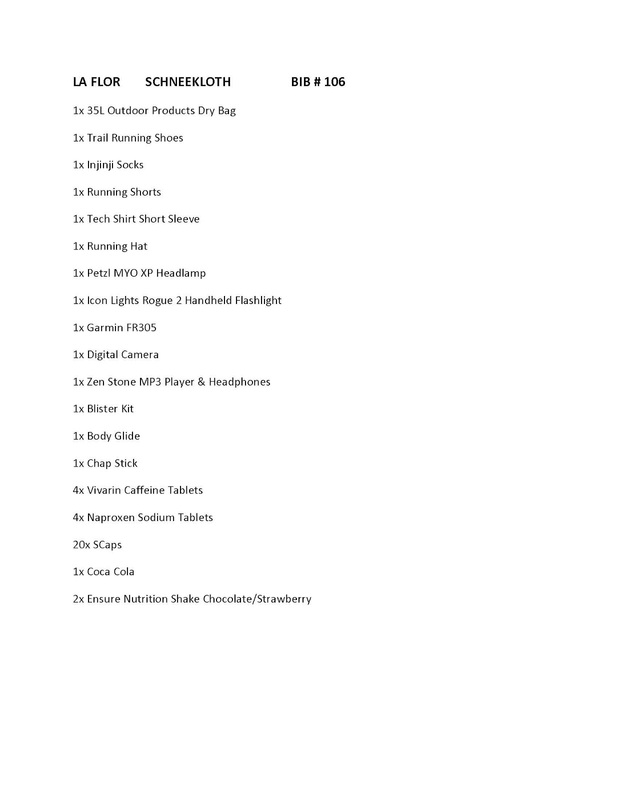 The list below shows the contents of my actual rage back pack as well as the running gear for race day. Again, I'm sure I missed a bunch of stuff and packed stuff I don't need, but eventually I'll learn. If I can just make it through a distance over 50 miles without a major blister, that would be a big victory for me. Oh well, hopefully this is the time and place....yeah right! I also completed my collection of shoes for the 5K charity race that will take place on Sunday after the race for the local youths on the island. I managed to collect just short of my goal of 50 pairs of shoes, but I am so glad and thankful to everyone that was willing to help out in any way they could. It allowed me to fill a giant duffle back with 40 lbs of running shoes for kids. I am sure they will be put to good use. 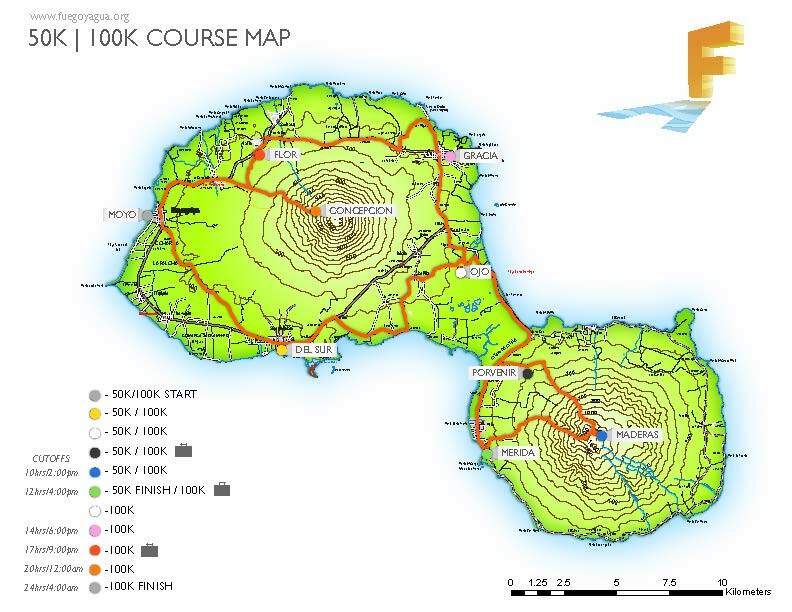 All that's left to do now is pack all the other stuff I think I'll need during the total of 6 days we'll be spending on this beautiful volcanic island called Isla de Ometepe.